Summary: Allen Institute researchers have produced a collection of computer generated models that accurately replicate cortical neuron activity. The Allen Institute for Brain Science has produced the first comprehensive, publicly available database of predictive neuron models, along with their corresponding data. The generalized leaky integrate-and-fire (GLIF) and biophysically detailed models are described in two articles published in the journal Nature Communications. The GLIF and biophysical models were built from extensive data in the Allen Cell Types Database: a massive publicly available repository of cortical neurons in both the mouse and human brain. Launched in 2015, this database contains electrophysiological, morphological, and transcriptomic properties gathered from individual cells, and models simulating cell activity, all building toward a “periodic table” of cell types. GLIF models reproduce the spike times of neurons and capture the abstract transformations taking place inside of neurons. These models have the benefit of requiring a relatively low level of computer power to simulate, meaning that it’s feasible to model the millions and millions of neurons making up the brain of a mouse. The biophysical models are more detailed. As such, they accurately represent the mechanisms reproducing the actual voltage waveform of action potentials (nerve pulses) and other forms of electrical activity across the dendritic tree and the cell body of neurons. Biophysical models take considerably more computational power than GLIF models to execute. “We have generated a large library of cell models – ranging from simple to complex – which can be put together like building blocks to construct higher-level circuit models, providing a valuable resource for the neuroscience community,” said Anton Arkhipov, Ph.D., an Allen Institute scientist. “The models can be used as building blocks for larger simulations, but also to understand how some cell types differ from the other. Researchers can classify cell types by only looking at model parameters,” said Stefan Mihalas, an Allen Institute scientist. 3D visualization of an Allen Institute biophysical neuron model firing action potentials. NeuroscienceNews.com image is credited to Allen Institute. Perhaps in the future, detailed models of multiple cell types can be used in larger simulations to model neurological or psychiatric disorders, such as epilepsy, autism or Alzheimer’s, and applying virtual perturbations to cells or networks of cells may allow us to see how the brain might respond to specific therapies. “Our models represent a large step in enabling scientists around the world to use standardized data, methods and models for exploring network behavior in the brain,” said Corinne Teeter, Ph.D., the lead scientist for the GLIF modeling effort at the Allen Institute. The GLIF and biophysical models, along with their corresponding data can be accessed on the Allen Institute Cell Types database at celltypes.brain-map.org. The model development and analysis repositories are freely available on the Allen Institute GitHub. Image Source: NeuroscienceNews.com image is credited to Allen Institute..
Video Source: Video credited to Allen Institute. Original Research: Open access research in Nature Communications. 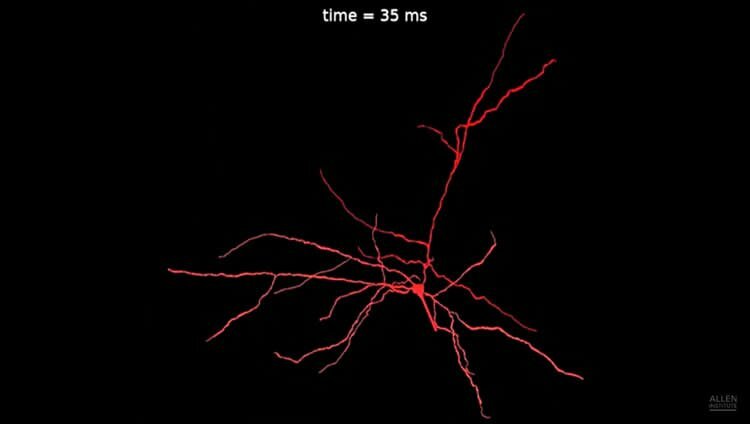 Allen Institute “Diversity of Cortical Neurons Captured in Comprehensive Computer Model.” NeuroscienceNews. NeuroscienceNews, 1 March 2018. Allen Institute “Diversity of Cortical Neurons Captured in Comprehensive Computer Model.” http://neurosciencenews.com/cortical-neurons-computer-model-8587/ (accessed March 1, 2018). The cellular components of mammalian neocortical circuits are diverse, and capturing this diversity in computational models is challenging. Here we report an approach for generating biophysically detailed models of 170 individual neurons in the Allen Cell Types Database to link the systematic experimental characterization of cell types to the construction of cortical models. We build models from 3D morphologies and somatic electrophysiological responses measured in the same cells. Densities of active somatic conductances and additional parameters are optimized with a genetic algorithm to match electrophysiological features. We evaluate the models by applying additional stimuli and comparing model responses to experimental data. Applying this technique across a diverse set of neurons from adult mouse primary visual cortex, we verify that models preserve the distinctiveness of intrinsic properties between subsets of cells observed in experiments. The optimized models are accessible online alongside the experimental data. Code for optimization and simulation is also openly distributed.